Saturday, May 13th- Join Us for the World Premiere of Canada's 1st Wine & Book Club! NIAGARA-ON-THE-LAKE, Ont. — With Mother’s Day just around the corner, PondView Estate Winery and Canada’s fastest growing publisher, Simon & Schuster Canada are excited to announce the launch of Canada’s First Book & Wine Club with free delivery to your front door. We all know that reading a book and enjoying a glass of wine on your couch, sunny patio or on the beach is a great way to get some well-deserved “Me Time”. Book Clubs are a popular way of connecting with friends over some great conversation, discussion and, more often than not, a glass of wine or two. 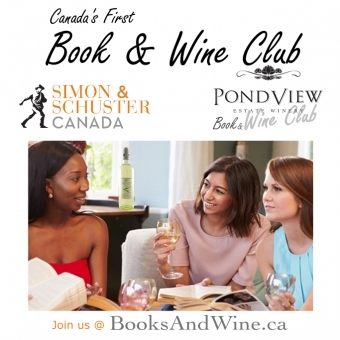 Simon & Schuster Canada and PondView Estate Winery are now making these experiences even more exciting and convenient for book and wine lovers across the country. 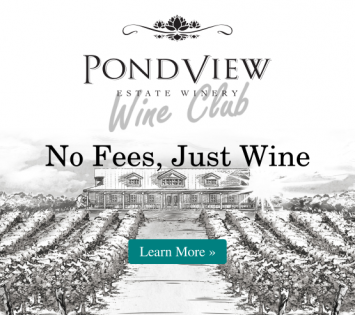 “Pairing our award winning VQA wines with some of Canada’s most famous author’s books has been an extremely rewarding experience,” says Brent Livingstone, Brand Ambassador at PondView Estate Winery. “Together with the team at Simon & Schuster Canada we are excited to make this idea a reality”. “We believe in embracing fresh perspectives and partnering on innovative campaigns. Celebrating Canada’s bestselling books with a glass of great Canadian wine, and having both conveniently shipped to your home or cottage is a natural fit for us,” concludes Adria Iwasutiak, Director of Publicity at Simon & Schuster Canada. For a proper launch of this joint Book & Wine Club ( www.booksandwine.ca ) PondView Estate is hosting bestselling authors Andrew Pyper; author of The Only Child and Amy Stuart; author of Still Mine for a book signing event in their barrel room on May 13th from 1:00 to 3:00 pm. * Give mom the ultimate Mother’s Day gift. When you order one of the Book & Wine Club packages, you get to choose one of three great Canadian books that is complimented by two bottles of PondView wines. You get to choose between red, white or a mix of both, depending on mom’s taste in wine. Order at www.booksandwine.ca and Mom will love you even more! * Share with your book club friends and save. Each book and 2 bottle wine package costs only $59.95 (including free delivery in Ontario!). By ordering as a group of 6 friends, everyone still receives a book and two bottles of wine, but at a preferred price of only $49.95 per person. Don’t have a book club yet? This is a great way to start one today. * Enjoy variety. Our book and wine selection rotates multiple times throughout the year with multiple book choices available at any time. * Meet the authors. Bring mom out to meet two bestselling authors and get her book signed while sipping on wine amongst the wine barrels at PondView Estate on May 13th. Similar events will be held throughout the year. Order a Book & Wine Club pack today and receive updates on events hosted at the winery. “We’ll be inviting all our Book & Wine Club customers to discuss the books and wines on our Instagram, Facebook and Twitter feeds and look forward to welcoming Canada’s bestselling authors to Niagara Wine Country.”, says Brent Livingstone. Please visit www.pondviewwinery.com for more information, Like PondView on Facebook, follow it on Twitter @pondviewwinery and share your photos on Instagram. As the fastest-growing publisher in Canada, we are building a home where fresh perspectives are championed and veteran voices are rediscovered. We have been marketing, selling and distributing since 2002 and publishing original works by Canadian authors since 2013. Our position as Simon & Schuster Canada is unique: we have all the energy and creativity of a start-up and the resources and business capabilities of one of the largest publishers in the world. Simon & Schuster, a division of the CBS Corporation, one of the world’s premier media companies, is a global leader in the field of general interest publishing, and is dedicated to providing a diverse range of quality books across a wide variety of genres and printed, audio, and digital formats to readers worldwide.